Gentrification. It is a word that we hear with increasing frequency in contemporary discussions about American cities. But what does that word really mean? And, even more importantly, what does it mean in the context of the region that I live in and love — the Rust Belt? Does gentrification mean the displacement of the poor — pushed aside to make way for the affluent? Or does it mean reinvestment in economically distressed neighborhoods that haven’t seen any significant investment in decades? It is important to be clear about the meaning of this increasingly ambiguous term, because what needs to happen in the vast majority of urban neighborhoods in the legacy cities of the Rust Belt is far less ambiguous. Despite over 50 years of well-intended social programs, concentrated generational poverty, entrenched socioeconomic segregation, and the resulting lack of social and economic opportunity for urban residents, still remain the biggest challenges for the older industrial cities of this region. High poverty rates in cities like Akron, Buffalo, Cleveland, and Detroit are partially due to regional economic conditions and structural economic challenges related to deindustrialization. But, overwhelmingly, concentrated poverty in these cities is due to private disinvestment in the urban core, made manifest by upper and middle-class flight to the suburbs, socioeconomic and racial segregation, and the loss of neighborhood retail and basic services. Today, the geographic disparities in household income between the central city and the surrounding suburbs remain profound. In Akron, Buffalo, Cleveland, and Detroit, respectively, 24 percent, 31 percent, 35 percent, and 36 percent of the population lives in poverty, as compared to 14 percent, 14 percent, 15 percent, and 15percent in these cities’ respective metropolitan areas. Keep in mind that these metropolitan area figures include the core city — meaning that poverty rates in the remainder of the metro area are even lower. Gentrification is a hot topic of conversation in coastal cities like New York, Washington, and San Francisco, with expensive living costs that are also home to influential journalists. Writing about gentrification is becoming a cottage industry for many pundits and urban policy wonks. Many of the pieces that have been penned on the topic are important, thought-provoking, and well-reasoned. But as more and more people in the Rust Belt read these accounts, and take them out of their geographic context, alarm over gentrification (particularly on the left) is steadily growing in metropolitan areas and housing markets where it should be the least of our urban policy concerns. In the eastern Great Lakes region, with its low cost of living, depressed housing markets, and surfeit of vacant and abandoned properties, most of the changes that are being held out as disturbing examples of gentrification — and are provoking hand-wringing in places like Buffalo, Cleveland, and Detroit — simply amount to the return of the middle class (with a sprinkling of the truly affluent) to several small pockets of the city. The degree to which these fledgling positive examples of private reinvestment in long-neglected neighborhoods have truly taken root and have begun to influence regional housing markets is still uncertain. As for documented cases of low-income residents being uprooted and displaced by spiraling housing costs — these have proven even more elusive. While it can be unclear whether the return of middle class and affluent residents to a neighborhood will really do anything to improve economic conditions for the poor, it is an ironclad certainty that a continued lack of socioeconomic diversity, and its concomitant concentrated poverty, will improve nothing and help no one in these cities — the poor most of all. For 50 years now, people, jobs, and economic opportunities have steadily left our cities for the suburbs. The status-quo in our region is, indisputably, one of widespread, entrenched urban poverty, geographically separated from (predominately suburban) economic opportunity. Yet, even the earliest signs of neighborhood revitalization and nascent attempts at building new housing and opening small businesses in these cities are frequently opposed by people who are convinced that they are acting in the name of social justice. Sincere as these anti-gentrification sentiments might be, I believe that they are harmful, and, if allowed to derail incipient efforts to reinvest in urban neighborhoods, simply serve to ensure that the existing dynamic of socioeconomic segregation will remain unchanged. In many cases, the very people who claim to be fighting the current unjust system are inadvertently perpetuating it. Gentrification alarmists have yet to come to grips with the fact that their position usually serves to reinforce the existing, highly inequitable situation. Many critics of Rust Belt gentrification are holding cities to an unreasonable standard, and placing them in an impossible situation. If much of the city remains poor and run-down, this is proof that the city does not care, and is not trying hard enough. If, on the other hand, parts of the city begin to attract new residents and investment, this is proof that the city does not care, and is not trying hard enough. Heads I win. Tails you lose. Sometimes, it seems that the only thing that people dislike more than the status-quo, is doing anything substantive to change it. In Akron, 81 percent of the people who work in the city and earn over $40,000 per year (hardly a king’s ransom) live outside of the city. It is unclear how Akronites living in poverty will be better off if these people remain in the suburbs. Let’s get concrete. If you are a well-educated, middle, or upper income person (and if you’re reading this, you probably are), and you live in an economically diverse urban neighborhood, is your presence a bad thing for your community? Should you move, instead, to a suburban community that is likely to be highly-segregated and economically homogeneous? If you are an entrepreneur starting-up in the urban core, should you decide to open your business somewhere else? And how, precisely, will doing that help the community that you are leaving behind? 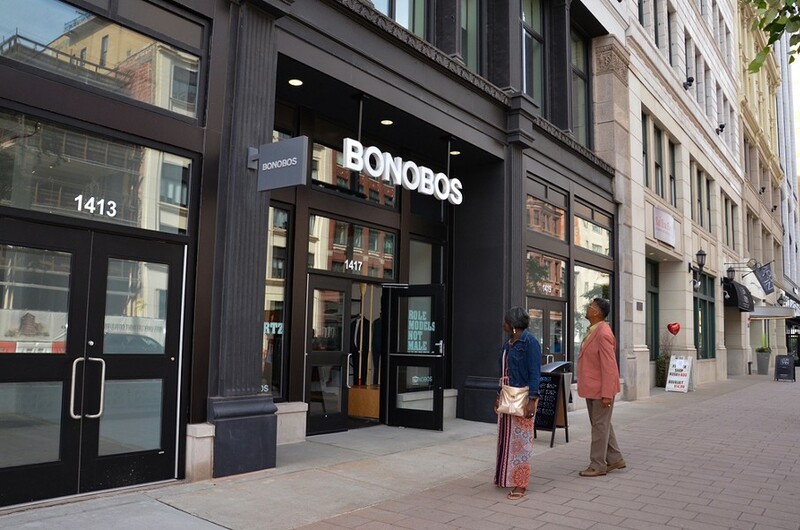 When middle class people return to urban neighborhoods, they have some disposable income, which helps create markets for retail and small business, that, in turn, provide basic services and job opportunities for the urban poor. This means that urban residents who are struggling to get by may no longer need to over-extend themselves to purchase a car, or endure long and inconvenient bus rides to access entry-level jobs and basic services in far-flung suburbs, but instead may be able to save time and money by walking to businesses in their own neighborhoods. With the return of middle and upper income residents, business districts and housing markets, long dormant, may begin to approach at least minimum levels of functionality and attractiveness to prospective entrepreneurs, investors, and residents. For existing urban homeowners, the gradual rise in property values in areas with extremely depressed and artificially low home prices often means the difference between a house ultimately being rehabilitated, or it beginning a tortuous cycle of neglect and decline, culminating in demolition. This is especially important in the legacy cities of the eastern Great Lakes, where low property values and a glut of vacant and abandoned properties, rather than financially crippling housing costs, are the largest real estate challenge. And, unlike superstar cities on the coasts, cities in this region still have large percentages of households that are comprised of working-class homeowners living in single-family homes. Take it from someone like me, who lives in Akron, a city with 96,000 housing units — and where only 16 single-family homes were built last year, while nearly 500 were torn down, and where the median value of an owner-occupied house is $78,000. To be sure, the return of new housing, small businesses, and more affluent residents is not a panacea, and there may be legitimate concerns, at some point, about how people moving back to the city might result in rising rents and higher property taxes for existing residents. But in the end, I have yet to see a proven model for improving economic conditions in an urban neighborhood that is predicated on ensuring that concentrated poverty remains. Maintaining the status-quo in urban neighborhoods, in the name of opposing gentrification, will do nothing to help the poorest and most vulnerable residents. Cities typically begin to rebound with small successes in individual neighborhoods, attracting new housing and jobs, and eventually building upward and outward from there — setting the stage for further incremental investment by the private sector. If we urbanists truly believe that socioeconomically and ethnically diverse neighborhoods are as important as is often claimed, we cannot panic every time a new house is built, a new person moves in, or a new business opens. These are overwhelmingly good things for neighborhoods and cities that have seen precious little investment for decades. Should we remain vigilant, and work together, in a cross-sector manner, to help ensure that the rising tide is actually lifting all the boats? Should we double-down on the status-quo in our region — one of entrenched poverty and racial segregation, because we are afraid of what any type of socioeconomic change could mean for a neighborhood? Squelching private investment in the urban core is the wrong solution to the wrong problem. It will only serve to ensure that lower income, middle income, and upper income people continue to live apart in separate and unequal enclaves, and it will make social and economic conditions in our urban neighborhoods worse, rather than better. If we are really serious about breaking down barriers in our neighborhoods, and celebrating socioeconomic diversity, then we have to come to grips with what that means and what that looks like. Yes, it is complicated, and messy, but it is simply not good enough anymore to say that the status-quo is unacceptable. We need more than words. We need to act. We need to fight the correct enemy. We need to do more than curse the darkness. We need to light a candle. We don’t need more top-down economic silver bullets. We need collaborative, incremental change - person-by-person, neighborhood-by-neighborhood, informed by humility, prudence, sensitivity, wisdom, and love for our neighbors. Working together, we can become a much better-connected, more cohesive, coherent, and equitable place. The only people who can stop us from becoming that place are we ourselves. It’s not enough anymore to be against something. It’s time to be for something. Jason Segedy is the Director of Planning and Urban Development for the City of Akron, Ohio. Segedy has worked in the urban planning field for the past 22 years, and is an avid writer on urban planning and development issues, blogging at Notes from the Underground. A lifelong resident of Akron’s west side, Jason is committed to the city, its people, and its neighborhoods. His passion is creating great places and spaces where Akronites can live, work, and play. This story was originally published on Segedy's blog last year; it is republished here with permission.